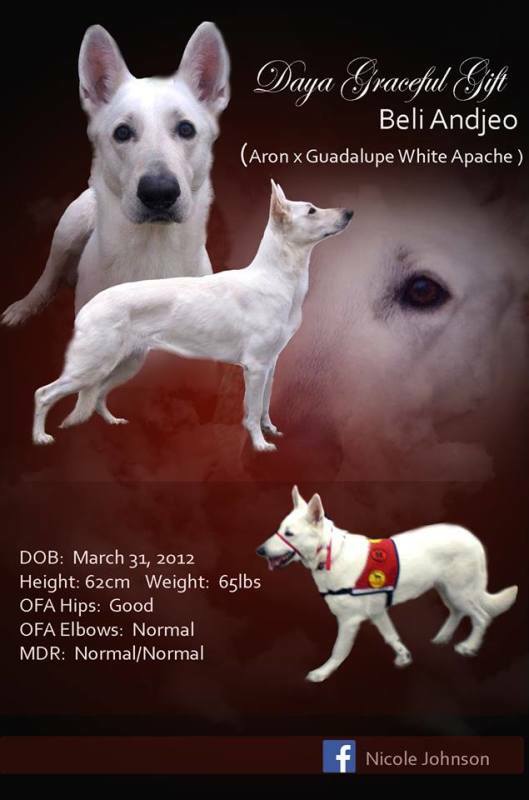 Daya is our stunning FCI registered White Swiss Shepherd. She comes from an amazing breeder out of Bosnia who focuses on both the importance of structure as well as stability of temperment and intelligence. Daya's solid structure is easy to see here. Daya has a short coat, which is easy to maintain, and exceptional black pigment. She is very in tune to the people around her and always seeks out to comfort those in distress. A very important trait when breeding for Service Dog qualities. If you would like to read more about her you can click on this link to her page where you can also access links to her breeders page and check out their titles and health clearances.